01 Divide the ground beef into 4 and using the Weber Burger Press, shape your patties. Season with salt and pepper and refrigerate until you are ready to barbecue them. 02 To make the burger dressing, stir all the ingredients together. Wash the vegetables. Tear lettuce into coarse pieces, and cut the tomatoes into neat slices. Peel the onion and chop finely. 01 Preheat the barbecue for medium direct heat (225 – 250ºC). 02 Place the burgers over the direct heat. Close the lid and grill for 3 minutes before turning and closing the lid again. 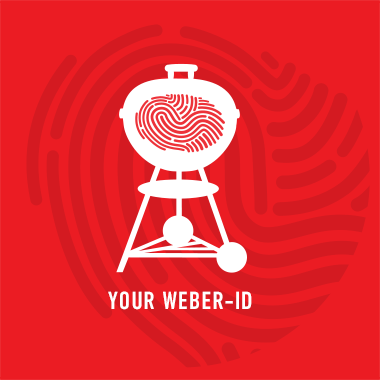 Use a Weber Instant Read Thermometer to check the internal temperature (75ºC). 03 Brush the burgers with BBQ sauce at the very last minute and put a slice of cheese on top of each burger to melt. Put the bacon over the direct heat to cook. 04 Remove the burgers from the grill and let them rest so the juices can collect. 05 Brush the burger buns with a little olive oil and barbecue until lightly golden. 06 Assemble the burgers and serve.